Tires are expected to perform for thousands of miles while retaining their essential performance and safety properties. Body Ply: Body plies function as the structure of the tire and provide the strength to contain the inflation pressure. It also gives the tire strength and flexibility. Bead: Tire bead assures an air-tight fit to the wheel. Belts: Belts provide stability and strength to the tread area of the tire. Innerliner: A rubber compound used to retain the inflation pressure inside the tire. Sidewall: A rubber compound used to cover the body plies on the sides of the tires, which provides protection from road and curb damage. 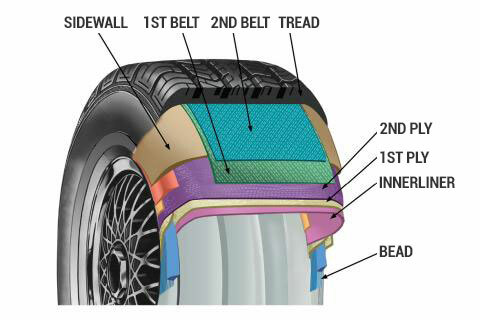 Tread: The tread rubber compound and tread pattern provides grip and traction. Natural rubber provides specific performance characteristics to tires. It is especially good for tear and fatigue crack resistance. The two main synthetic rubber polymers used in tire manufacturing are butadiene rubber and styrene butadiene rubber. These rubber polymers are used in combination with natural rubber. Physical and chemical properties of these rubber polymers determine the performance of each component in the tire as well as the overall tire performance (rolling resistance, wear and traction). Another important synthetic rubber is halogenated polyisobutylene rubber (XIIR) commonly known as halobutyl rubber. This material causes the innerliner to be impermeable, which helps to keep the tire inflated. Steel wire is used in the tire belts and beads, and the plies for truck tires. The belts under the tread serve to stiffen the tire casing and improve wear performance and tire handling. The bead wire anchors the tire and locks it onto the wheel. Textiles in tires are various types of fabric cords that reinforce the tire. Tire fabric cords provide dimensional stability and help support the vehicle weight. These textiles are polyester cord fabrics, rayon cord fabric, nylon cord fabric, and aramid cord fabric. They are used to make the tire plies in passenger tires. While they serve as the primary reinforcing material in the tire casing and they also help the tire keep its shape in different road conditions which provide added endurance and performance characteristics to the tire. Both carbon black and silica are fillers that reinforce the rubber, that is, improve properties such as tear, tensile strength and abrasion. This results in improved wear performance and traction. Silica use improves rolling resistance. Antioxidants help to keep rubber from the breaking down due to the effect of temperature and oxygen exposure. 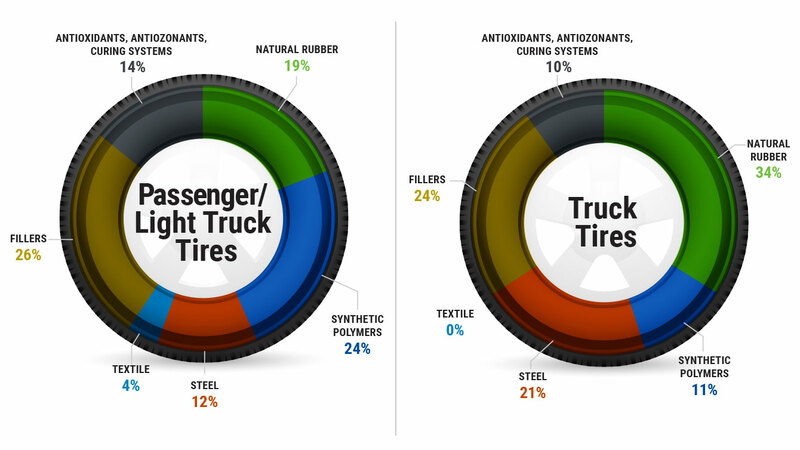 Antiozonants are used to impede the effects of exposure to ozone on the surface of the tire. Sulfur and zinc oxide, are crucial ingredients to transform rubber into a solid article during vulcanization or tire curing. Curing systems shorten the vulcanization time and impact the length and number of crosslinks in the rubber matrix that form during tire curing or vulcanization.